A right triangle (American English) or right-angled triangle (British English) is a triangle in which one angle is a right angle (that is, a 90-degree angle). The relation between the sides and angles of a right triangle is the basis for trigonometry. The side opposite the right angle is called the hypotenuse (side c in the figure). The sides adjacent to the right angle are called legs (or catheti, singular: cathetus). Side a may be identified as the side adjacent to angle B and opposed to (or opposite) angle A, while side b is the side adjacent to angle A and opposed to angle B. If the lengths of all three sides of a right triangle are integers, the triangle is said to be a Pythagorean triangle and its side lengths are collectively known as a Pythagorean triple. where a and b are the legs of the triangle. This formula only applies to right triangles. Each leg of the triangle is the mean proportional of the hypotenuse and the segment of the hypotenuse that is adjacent to the leg. For solutions of this equation in integer values of a, b, f, and c, see here. The altitude from either leg coincides with the other leg. Since these intersect at the right-angled vertex, the right triangle's orthocenter—the intersection of its three altitudes—coincides with the right-angled vertex. where c is the length of the hypotenuse, and a and b are the lengths of the remaining two sides. Pythagorean triples are integer values of a, b, c satisfying this equation. , semiperimeter s, area T, altitude h opposite the longest side, circumradius R, inradius r, exradii ra, rb, rc (tangent to a, b, c respectively), and medians ma, mb, mc is a right triangle if and only if any one of the statements in the following six categories is true. All of them are of course also properties of a right triangle, since characterizations are equivalences. A and B are complementary. where P is the tangency point of the incircle at the longest side AB. The length of one median is equal to the circumradius. The shortest altitude (the one from the vertex with the biggest angle) is the geometric mean of the line segments it divides the opposite (longest) side into. This is the right triangle altitude theorem. The triangle can be inscribed in a semicircle, with one side coinciding with the entirety of the diameter (Thales' theorem). The circumcenter is the midpoint of the longest side. The circumcircle is tangent to the nine-point circle. The orthocenter lies on the circumcircle. For the expression of hyperbolic functions as ratio of the sides of a right triangle, see the hyperbolic triangle of a hyperbolic sector. The values of the trigonometric functions can be evaluated exactly for certain angles using right triangles with special angles. These include the 30-60-90 triangle which can be used to evaluate the trigonometric functions for any multiple of π/6, and the 45-45-90 triangle which can be used to evaluate the trigonometric functions for any multiple of π/4. Since the sides of this right triangle are in geometric progression, this is the Kepler triangle. Thales' theorem states that if A is any point of the circle with diameter BC (except B or C themselves) ABC is a right triangle where A is the right angle. The converse states that if a right triangle is inscribed in a circle then the hypotenuse will be a diameter of the circle. A corollary is that the length of the hypotenuse is twice the distance from the right angle vertex to the midpoint of the hypotenuse. Also, the center of the circle that circumscribes a right triangle is the midpoint of the hypotenuse and its radius is one half the length of the hypotenuse. 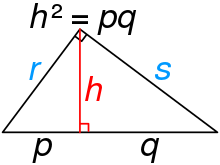 The median on the hypotenuse of a right triangle divides the triangle into two isosceles triangles, because the median equals one-half the hypotenuse. In a right triangle, the Euler line contains the median on the hypotenuse—that is, it goes through both the right-angled vertex and the midpoint of the side opposite that vertex. This is because the right triangle's orthocenter, the intersection of its altitudes, falls on the right-angled vertex while its circumcenter, the intersection of its perpendicular bisectors of sides, falls on the midpoint of the hypotenuse. The right triangle is the only triangle having two, rather than one or three, distinct inscribed squares. ^ Di Domenico, Angelo S., "A property of triangles involving area", Mathematical Gazette 87, July 2003, pp. 323-324. ^ a b Posamentier, Alfred S., and Salkind, Charles T. Challenging Problems in Geometry, Dover, 1996. ^ a b c d e Inequalities proposed in “Crux Mathematicorum”, . ^ a b c d Andreescu, Titu and Andrica, Dorian, "Complex Numbers from A to...Z", Birkhäuser, 2006, pp. 109-110. ^ a b c CTK Wiki Math, A Variant of the Pythagorean Theorem, 2011, . ^ Darvasi, Gyula (March 2005), "Converse of a Property of Right Triangles", The Mathematical Gazette, 89 (514): 72–76 . ^ Di Domenico, A., "The golden ratio — the right triangle — and the arithmetic, geometric, and harmonic means," Mathematical Gazette 89, July 2005, 261. Also Mitchell, Douglas W., "Feedback on 89.41", vol 90, March 2006, 153-154. ^ a b c Posamentier, Alfred S., and Lehmann, Ingmar. The Secrets of Triangles. Prometheus Books, 2012. ^ Bailey, Herbert, and DeTemple, Duane, "Squares inscribed in angles and triangles", Mathematics Magazine 71(4), 1998, 278-284. Weisstein, Eric W. "Right Triangle". MathWorld. Wentworth, G.A. (1895). A Text-Book of Geometry. Ginn & Co.
Wikimedia Commons has media related to Right triangles.